First, I want to apologize for leaving you without any recent blog updates. Christen and I have been very busy behind the scenes working on storyline development and the official Karma Documentary trailer. The official trailer is not quite finished yet, but expect an announcement soon about its release! Now that we are nearing this next post-production milestone, expect to see regular blog updates about the continuation of the story. I will share my experiences from many other areas of Nepal, ranging from the hills around Kathmandu to the plains and jungles of the Terai region. There are many more behind-the-scenes photos, videos, and stories to share with you! I thought I already understood what Fredric was trying to tell me on that cloudy April day in Washington. After all, I had traveled out of the country many times before. I pride myself on having an open mind and rarely turn down the chance to try new things or expose myself to different cultures. I like to interact with locals wherever I go, try strange food, listen to unfamiliar music, and ask about people’s daily lives. Surely, Fredric was not telling me about the virtues of being a ‘traveler’ for my own benefit. He was just explaining it so that I could use his explanation for the film, right? I was almost four weeks into my time in Nepal before I understood that Fredric was absolutely talking to me. “Did you hear back from the lady with the guest house?”, I said groggily over my breakfast to Jenn while the assorted noises and smells of Kathmandu wafted in from the street. We had been in Kathmandu for three days, and while exciting and exotic, the noise, pollution, and hectic pace were starting to wear on us. “Yeah, I finally got an email from Amanda confirming the rooms, but the directions seem a little sketchy…”, she replied. I was looking forward to the change of pace, but I secretly worried whether there would be enough to see in Changu Narayan to keep us busy for a week. 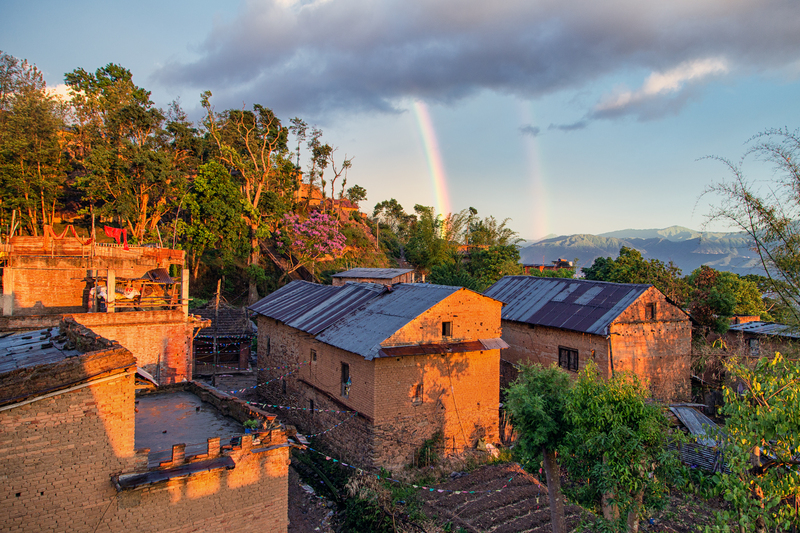 Jenn had originally booked an apartment in Bhaktapur, a popular and bustling ancient Newar city in Kathmandu valley. 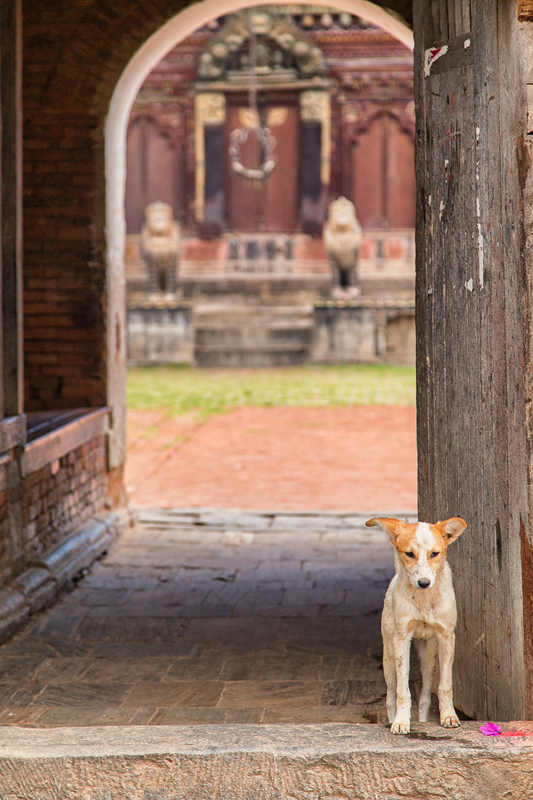 We learned the day before that the Bhaktapur apartment was no longer available. The property manager, a retired American woman named Amanda, recommended the alternate place. Normally, the twist would not bother me at all, but I was a little apprehensive no longer having the experience of Glen or Karma to guide us. I would soon learn both how wrong my worries were and how right Fredric was about my needing to learn what it means to be a traveler. “Are we really going to fit all of these bags and ourselves into one cab?”, puzzled Tatiana as we gathered at the front of the Lhasa guest house, my on again/off again home base in Kathmandu. “Well, I asked Nwang to call for a van…”, I trailed off, taking in the almost ridiculous amount of luggage piled up. (Who knew that shooting on-location in Nepal would require so much stuff?). As the “van” pulled up, I said a silent thank you that there was a roof rack. Regardless of it’s vehicle class, the van looked like it would barely fit the four of us, let alone our luggage. We set to work loading our gear. 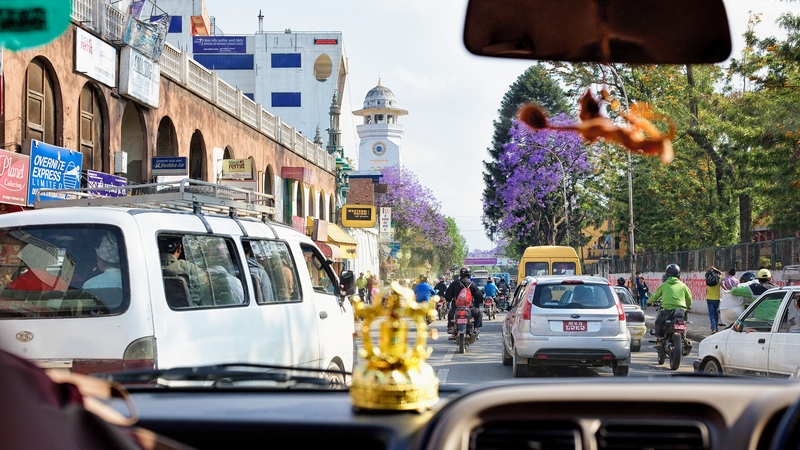 ©Luke Mislinski – Taking a cab in Kathmandu is an adventure rivaling a cab ride in any city. 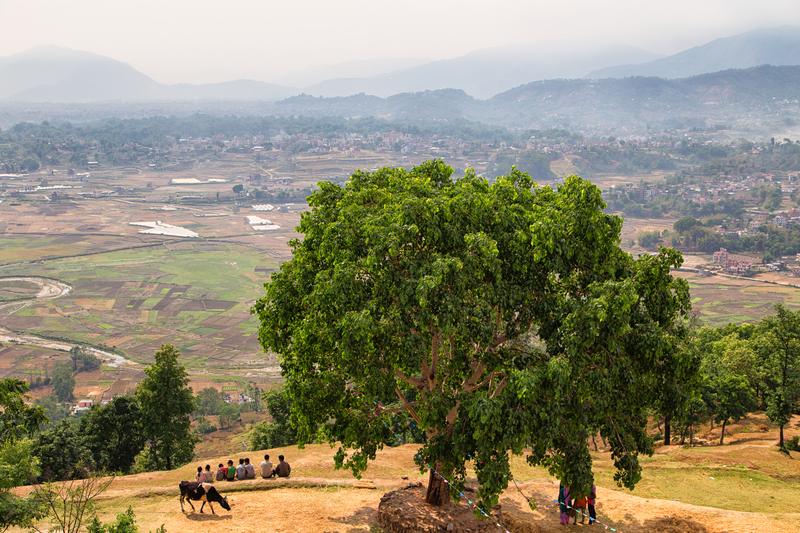 “Can you take us to Changu Narayan?”, I asked the cab driver, hoisting the last bag up to him on the top of the van. “Changu? Hajur (yes). Where are you staying?”, he grunted as he deftly hopped off the roof of the van. “I guess we will have to get the location of the guest house when we get there”, I explained to the driver. With that, we all crammed into the tiny van and started off on our next phase of the adventure. 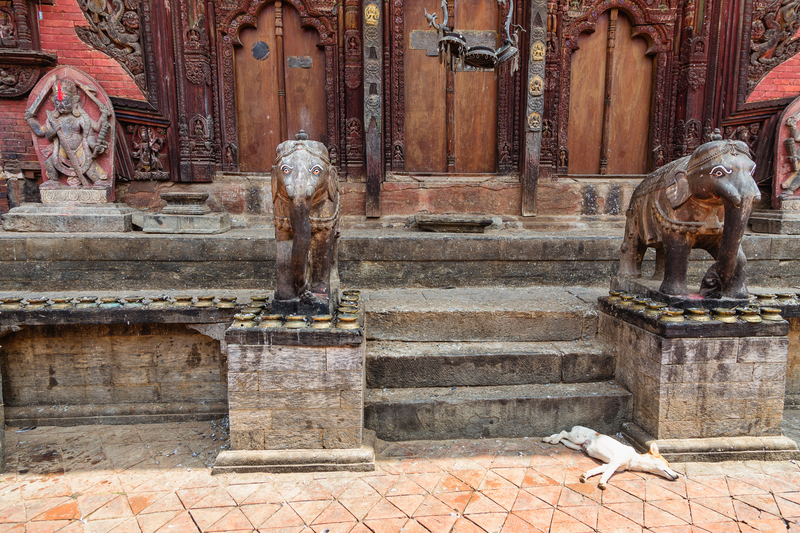 ©Luke Mislinski – Changu Narayan is home to the oldest Hindu temple in Kathmandu Valley. 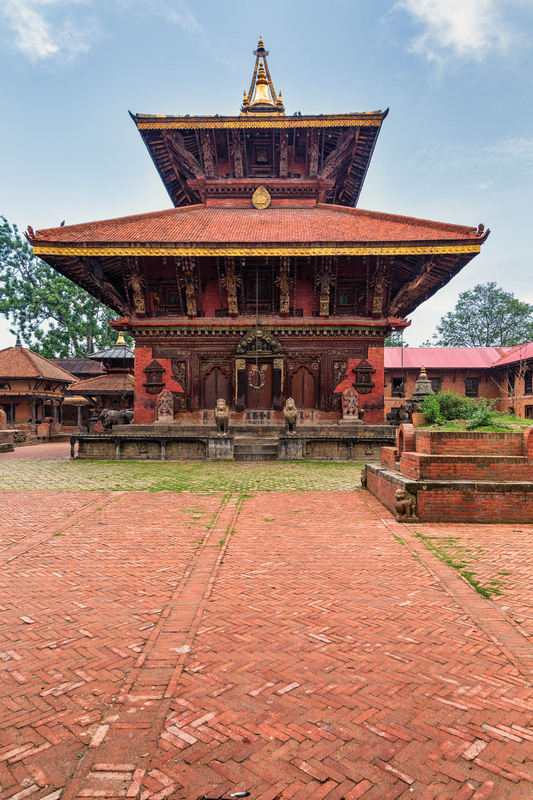 Changu Narayan, located high on a steep hillside overlooking Kathmandu from the east, is home to the oldest temple in Kathmandu Valley. It is believed to date back to the 4th century. As our taxi labored up the frighteningly narrow and twisting road, Jenn tried calling Amanda. “That’s weird”, she puzzled. “The call won’t go through. Here, listen to the message.” We would later learn that Changu was experiencing one of their regular coverage outages. We could not get through to either Amanda’s mobile or land lines. There was a message playing that made no sense to me. As we pulled into the bus park at Changu Narayan, the villagers welcomed us with open arms. After some local kids pointed the way to “Grandma’s house” (Amanda had made quite the impression in the village), we settled into our next little paradise. Amanda welcomed us into the guest house with the perfect blend of good old American Southern Hospitality (she retired to Nepal several years ago from Arkansas) and Nepali reverence for guests. I can see why she calls this place home now. I felt my earlier apprehensions melt away, as I strolled onto the rooftop terrace at Amanda’s guesthouse and took in the sweeping views of Kathmandu valley. Over the coming days, I would make new Nepali friends in Changu Narayan who would prove to be pivotal in helping complete filming over the next five weeks. Most importantly, they would help me discover the path to complete my personal journey, transforming me from a tourist into a traveler. 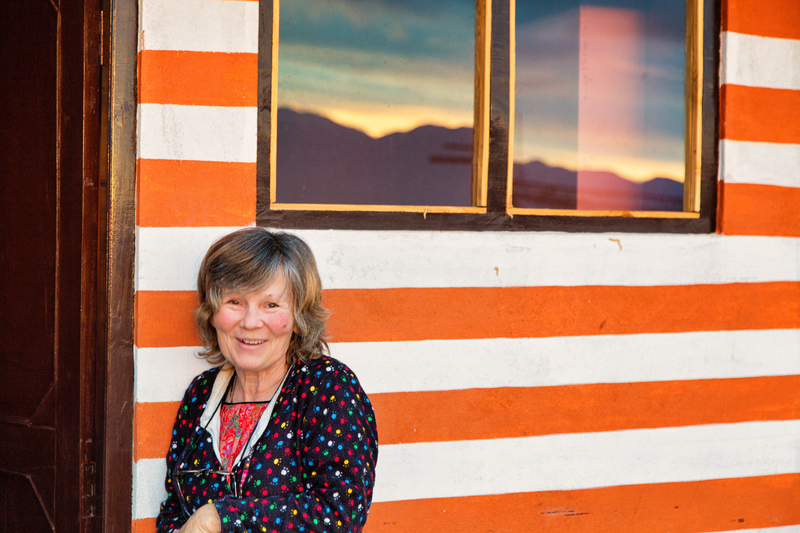 ©Luke Mislinski – Amanda, manager of our guesthouse in Changu Narayan, enjoys the sunset from the rooftop terrace. ©Luke Mislinski – View of Kathmandu to the West from Amanda’s guest house rooftop. If you would like to donate to the making of the film, please send money to Luke Mislinski Photography via Paypal.